Without any further words we give all the puzzles and our short solutions to each of them. To see the solutions, select the text in your browser (e.g. by dragging the mouse). birds remain on the clothes line? the previous date that yields a palindrome in this format. A) It will start moving to the left. B) It will start moving to the right. C) It will stay in the same place. Assume that the wheel of the bicycle doesn't slip on the ground (i.e. 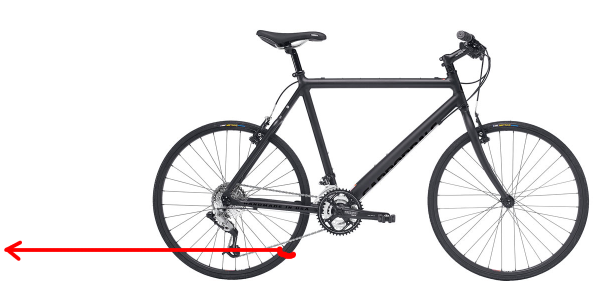 the bicycle stays in an upright position all the time. In a two-child family, one child is a boy. What is the probability that the other child is a girl? may have as many children as she wants to, until she gives birth to a girl. happen in the next 100 years? 1. Exactly one statement on this list is false. 2. Exactly two statements on this list are false. 3. Exactly three statements on this list are false. 2004. Exactly 2004 statements on this list are false. a) Determine which statements are true. b) Replace "exactly" by "at least". Again, determine which statements are true. How many letters does the _shortest_ correct answer to this puzzle contain? the future, on which days of the week won't any century ever end? die). They all know this information. the hideout. Otherwise the currently youngest robber is shot. the ends of wires in an arbitrary way. last two pieces that moved before the current position was reached. A move is written as [piece][x](destination square). From the numbers 1, 3, 4 and 6 create an expression giving the result 24. You may use only parentheses and the operations +, -, * and /. You have to use each of the given four numbers exactly once. The sum of some (not necessarily distinct) positive integers is 34. What is the greatest possible value of their product? of the prisoners' heads. Each of these hats will be either white or black. Now the shaman will ask each of the prisoners to guess the color of his hat. correct, he is released immediatly, otherwise he is left to be eaten. be saved if they find the optimal strategy? only specify how many diamonds will which of the robbers get? How much is 680 + 369? in a row is already 6.
of 2 heads and 1 tail. b) ... the sequence HT? c) ... the sequence HHTHHHHHTHHHHHHTHHHHHTHHHH? hard to create a really challenging last hard puzzle. We succeeded. Question: Will you participate also in IPSC 2006? Zero, the others will fly away as soon as they hear the shot. Ever seen birds? By solving a simple equation we get the answer: 9. We need the closest year that yields a valid MMDD when reversed. Clearly 2000 doesn't work, thus the last digit in D is 1. The best choice is clearly DD=31 (and thus YYYY=13..). Now we want to maximize the second digit of MM. It can NOT be 9, because September has only got 30 days. Thus MM=08 and the whole date is 08311380. At each moment, the wheel is turning around the point where it touches the ground. From this observation it can be easily seen that the resulting torque causes the wheel to rotate to the left. In both cases 6 cuts clearly suffice. Now consider any of the small cubes that was initially completely inside the large cube. Whatever we do, in each cut we will only manage to create one of its faces. Thus 6 cuts are necessary. A classical example of conditional probability. There are 3 equally possible families: (older boy, younger girl), (older girl, younger boy) and (older boy, younger boy). In 2 of these cases the other child is a girl, thus the answer is 2/3. The ratio will stay 1:1. Consider all families that have a baby. Approximately one half of these babies are girls, half of them are boys. Some of these families "advance to the next round" to have more babies. Now consider the second-born babies. Again, the ratio of boys vs girls is 1:1... and so on. a) The statements contradict each other, thus at most one is true. If none of them were true, the last statement would be true -- a contradiction. Thus exactly one is true, 2003 are false. The true statement is #2003.
b) If statement #k is true, so are statements #1..#(k-1). Let there be exactly k true statements. The (true) statement #k says that there are at least k false statements. The (false) statement #(k+1) says that at least (k+1) statements are false. This means that there are exactly k false statements, and thus k=2004/2=1002. True statements are #1 to #1002. By using a calendar we can quite easily find that the last day of the century repeats with a period 4. (This corresponds to 400 years. As soon as we see that the last weekdays of 2000 and 2400 are the same, we may conclude that the sequence is periodic, because the pattern of leap years repeats with the same period.) The never-occuring days are Tuesday, Thursday and Saturday. Let N be the number of robbers. If N=1, the only robber takes the loot. If N=2, the vote of robber 2 is enough to split the loot. If N=3, robbers 1 and 2 know that IF robber 3 dies, they get 50% each (the result for N=2), thus they won't vote for 33.3% and robber 3 dies. By extending this result we see that the robbers agree iff their count is a power of 2. Thus there will be 512 survivors, 256 of them will vote for splitting the loot (and saving their necks), the others will be against it. Label lower ends X1 to X2005. Connect: X1-X2, X3-X4, ..., X2003-X2004. Climb up. Find the pairs, label them U1-U2, ..., U2003-U2004 (in an arbitrary way, the numbers won't match the lower ones yet). The last wire will be U2005. Connect U2-U3, U4-U5, ..., U2004-U2005. Climb down. Disconnect everything, but keep the old marks. Relabel X2005 to L2005. Find its current pair Xn, label it L2004. Its previous pair [for the record: it is X((n-1) xor 1 + 1)] will be L2003. Continue in the same way until all wires have a L label. Now clearly for each n Ln and Un are opposite ends of the same wire. Black couldn't move last (the king would have to move from check and there is no way he could get it one move earlier). Thus the last to move was white. White pawns didn't move, white rook couldn't. Two last moves remain: Nb3a1 and Kd1c1. It looks as the problem with the black king remains. The solution is simple: the moving white piece could capture a black piece that made black's last move. By trying out all possibilities we find that the only way this could happen is that the white king captured a black knight. 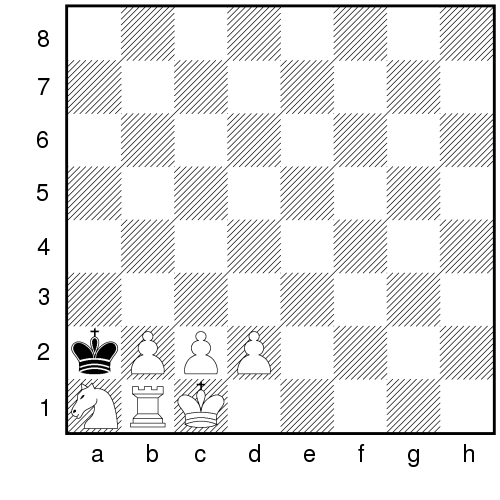 Thus the last move was white's Kxc1. Black's last move was Nc1 (either from d3 or e2). Let 34 = a_1 + ... + a_k. If some a_i >= 4, we may replace it by 2 and (a_i-2). If some a_i is 1, we may replace a_i and a_1 by (a_i+a_1). Thus in the optimal solution all a_i are either 2 or 3. As 2*2*2 < 3*3, there are no more than two 2s. Thus the only optimal way is 34 = 2 + 2 + ten times 3. The product is 4*3^10 = 236196.
and announces the corresponding color. Now the person N-1 computes this sum for the hats he sees. The difference is the color of his hat. He announces it and is saved. From now on all persons know his hat's color and thus they can include it in their computations. Thus everybody else computes his hat color in the same way. Note that for K=2 this reduces to the first person announce the parity of white hats. a) E alone gets everything. Thus if there are D and E, E rejects any proposal and D is shot. CDE: C knows that D wants to survive. Thus D will vote for any proposal. C proposes that he gets all the diamonds, this is agreed upon. BCDE: B knows that he needs two votes to survive. If he dies, C gets 1000, D and E nothing. He has to give something to each of them, otherwise they will vote against him (due to their bloodthirst). Thus B's proposal is B 998, C 0, D 1, E 1. ABCDE: A needs 2 votes. The cheapest way is to pay C and (D or E). Both ways leed to A getting 997 diamonds. b) The cases E and DE remain the same. CDE: C, knowing that D will vote for any proposal where he survives, he proposes that he (C) gets all the diamonds and (bloodthirst!) that E is shot. BCDE: B knows that he has the vote of E that wants to survive. He needs one more, thus he has to pay D. Now he can have C shot and because of his bloodthirst he will do so. His proposal: B 999, C shot, D 1, E 0. ABCDE: A has the vote of C, pays 1 for the vote of E. His winning proposal: A 999, B shot, C 0, D shot, E 1.